Caribbean Sun Beach Condos-A brand new condo, 250 meters from Heywoods beach! a spacious 1400 square feet of space !!! The total square footage of the condo unit is a stunning 1400 square feet of space complemented by 9 foot ceilings and an ample supply of large windows and ceramic floors throughout;The condo is equipped with a full kitchen with stove,refrigerator,toaster utensils and cutlery.Each bedroom has a built in wall safe.Bedroom 1 has a queen size bed and bedroom 2 has two twin beds,the twin beds can be joined to make a king size bed.Both bedrooms are equipped with air-conditioners.The bedroom at the back of the premise has a door that leads to a large wooden deck that is perfect for sipping a rum punch and enjoying the beauty of this tropical paradise.The deck an also be accessed from the main corridor in the unit.The living room is large and airy and equipped with ceiling fans.The condo has a full bathroom equipped with a large tub and shower and a second half bath equipped with a lavatory facility.The unit also has a laundry room equipped with a laundry sink and a washing machine. Famed for it’s year round sunshine and warm blue waters, Barbados is a coral island surrounded by reefs and spectacular long white sand beaches. It is one of the smaller islands and is the most easterly of the Caribbean Islands measuring 21miles by 14 miles. The west coast (also known as the "platinum coast") is a fringe of bays and coves along the sheltered, Caribbean side of the island. As a result it is the best coast for snorkelling as reefs are close to shore and the Caribbean Sea provides calm water. There are opportunities to explore this stunning island by land, (going off - road in a 4x4 Land Rover or hiring a car), by air in a helicopter tour, or by sea on board one of many cruises on offer. How ever you choose to travel, you will find cultural attractions, such as the splendid architecture, art, music, theatre and fine cuisine as well as a whole host of sporting activities, including hiking, tennis, polo, scuba diving, boating and deep sea fishing. St Peter is located on the West Coast and is home to the beautiful Mullins Beach and Gibbs Beach famous places to relax under the Casuarina trees. Caribbean Sun Beach Condo is also close to Heywoods Beach in St Peter which is stunning, wide and quiet. You will find calm water perfect for swimming and snorkelling, and miles of white sand beaches to walk along. 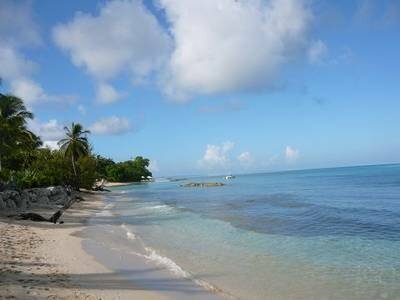 Brilliant sunshine and a wide range of places of interest make St Peter in Barbados a perfect Caribbean choice. Speightstown is only a short drive away for your local shopping and restaurants. The premise has 2 bedrooms,bedroom 1 is equipped with a queen sized bed and bedroom 2 has 2 twin beds. The extra(5th guest) person is provided a twin airbed for accomodation. The front verandah has beautiful clay tiles with a wheel chair acessible ramp and is perfect for lounging.There is off street parking located in the front yard.The back of the premise facing Port St Charles is equipped with a large deck made of rich purple heart wood.There is an outdoor shower for washing away the salt from the beautiful caribbean sea after a day of fun in sun at Heywoods beach a mere 250 M away!!! !